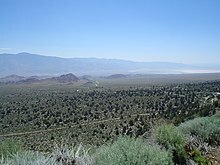 Owens Valley, Alabama Hills, and Owens Lake seen from Whitney Portal Road, west of Lone Pine, CA. 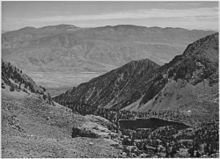 Owens Valley, photographed from Sawmill Pass by Ansel Adams, circa 1936. 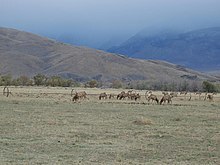 Tule Elk grazing in Owens Valley. 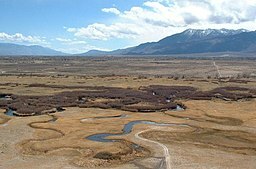 ^ "Owens Valley". Geographic Names Information System. U.S. Geological Survey. 2009年5月3日閲覧. ^ a b c Smith, Genny; Jeff Putnam (1976). Deepest Valley: a Guide to Owens Valley, its roadsides and mountain trails (2nd ed.). Genny Smith books. ISBN 0-931378-14-1. ^ a b Alt; Hyndman (2000). Roadside Geology of Northern and Central California. Missoula: Mountain Press Publishing Company. ISBN 0-87842-409-1. ^ Gilbert, Bil (1985) . Westering Man: The Life of Joseph Walker. Tulsa: University of Oklahoma Press. pp. 144–46. ISBN 0806119349. https://books.google.com/books/about/Westering_Man.html?id=h7BQjaTxHy8C. ^ Libecap, Gary D. (2008-04-05). “Chinatown Revisited: Owens Valley and Los Angeles—Bargaining Costs and Fairness Perceptions of the First Major Water Rights Exchange”. Journal of Law, Economics, and Organization 24 (2). http://fiesta.bren.ucsb.edu/~glibecap/Chinatownjleo.pdf.